Nine new early-stage, high-potential research projects are underway with support from Iowa State College of Engineering’s Exploratory Research Program. The program provides funding to faculty for novel ideas for new research efforts. Schneider’s project will focus on “a personalized approach to prescribing cancer therapeutics,” as a means to advance the treatment of cancer. This study will explore iron-based, less-costly alternatives for shape memory alloys (SMA), a material that can “undergo high inelastic strain and return to its initial shape.” Traditional SMAs contain Nitinol, a nickel and titanium compound, which can be expensive to manufacture for structural applications. Part of Xinwei Wang’s research project will explore the ET-Raman technique, as explained in the above figure. Song, along with fellow principal investigator Liang Dong, will examine “next-generation reconfigurable conformal airborne antennas.” Typical airborne antennas are “planner and conformal,” while the antennas Song and Dong plan to test will be double negative metamaterials. 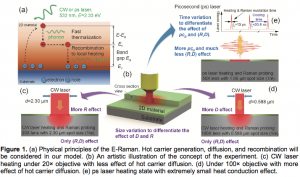 Li’s project will explore an electrochemical heat engine (ECHE) and “use adiabatic work exchanges to accomplish temperature cycling.” This process plans to overall increase the efficiency of the ECHE.